So numerous are the consequences of promotion to any form of top-flight football, that it’s nearly impossible to predict the future of a club thrown into foreign territory. Now, Hoboken FC will return to the Cosmopolitan Soccer League’s 1st Division next season as they cinch promotion from the 2nd Division after a thrilling 3-1 win against FC Spring Valley. 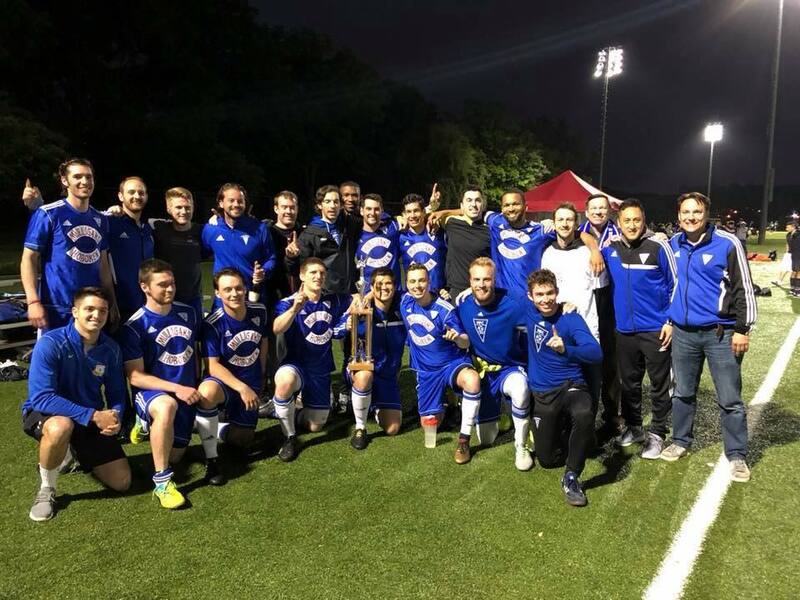 The entire 2nd Division of the Cosmopolitan Soccer League had to come down to the two most efficient teams through the season in the shape of CSL veterans Hoboken FC 1912 and FC Spring Valley this season. Both were set to face each other at Randall's Island with the outcome hard to determine as both teams has had memorable campaigns this time around. Cory Chaplin and Jeremy Witherspoon were last Sunday night's star attractions for the New Jersey's Hoboken FC. 2 goals on the day for Chaplin and one for Witherspoon made for a well-fought victory for one of the league's most historic clubs now going into the Cosmo League's Division 1 for the first time in over 4 years. Spring Valley managed to pull a goal back but couldn't fight back against the Hoboken back-line with players like Evan Reed, Mikhail Attong and company. Having Hoboken score by 3 at Randall's in the most significant match of the season with an consistent and exciting squad of players and only losing once in the league are all reminders of what this team has achieved this season. HFC Coach Marco Chung had a gameplan on how to keep Spring Valley away from creating chances in the box when off the ball and promote positive possesion when on it, they completed what they had to do that night and will test themselves among the Cosmo League's best in late 2018. "The team is prepared in all aspects..." a confident Coach Chung told the Cosmopolitan Soccer League following HFC's 3-1 win against Polonia Gwardia NY during Week 20 of the 2nd Division. When asked if the defense was going to have it easy knowing how strong Hoboken are going forward on the pitch knowing their spot in the final was confirmed, it was a similar answer, with the coach brimming with confidence. "I think overall we are playing [our] style going forward AND defensively. We know it's the final and every game is not the same. But we are confident that we will play a great game that day." One of the most progressive seasons in Hoboken's history within the 2nd Division, they've won promotion back into the top flight after a 4 year absence and were the most consistent team in the entire South and outscored everyone that they faced. In 16 games, they've scored a whopping 73 goals or an average of 4 1/2 goals a game. Earning 39 points by winning 12 matches, drawing 3 and only suffering a single loss, they bossed the competition with good momentum and never let go and has seen forward Chaplin score 19 all season -- just missing out on the Cosmo League's D2 Golden Boot for the 2017/18 season behind Polish side Stal Mielec NY's sharpshooter Bartlomiej Dziuban on 20. Defensively, they were strong as well. They only conceded 20 goals this season, making them only behind Polonia on 17 goals, as the best defensive team in the entire 2nd Division. With both sides of the 2nd Division clinched by Hoboken F.C. 1912 -- the 2nd Division and the Reserve Divisions -- things are looking up for the New Jersey team. FC Spring Valley's loss hurt. However, with a consolation goal in an effort to take the game back in the last couple of minutes of the D2 Championship Final, not many can put a bad word about their 2017/18 season as a whole. Spring Valley ended their season with a record of 11 wins, a single draw and 4 losses with 34 points. Throughout the season, they were a roller-coaster ride as they didn't get a good run of form until mid-November. By mid-season, 8 games in, they collected 4 wins and 4 losses. However, as they progressed and starting to develop their winning formula, wins started to gather and their team had big confidence going into the final of this D2 Championship match. A big asset to their push to the top came from their top goalscorer for the season and the Northern Division's top striker: Omar Aragon. The 5'9'' attacker quite literally scored for fun this season for FC Spring Valley. In his record of only 5 appearances for the Rockland County side, Aragon has notched 19 goals this season. Forming one of the North Division toughest forward duos alongside teammate Roberto Garcia-Garcia, who has scored 14 in 9 games, they were often the providers of absolute screamers this entire campaign. But neither Aragon or Garcia could break down Hoboken's defense last Sunday and it is now the New Jerseyans who will play D1 football yet again after the summer window. But all is not lost for the Valley as a chance at redemption is now available come June 10th where they will face off Polonia Gwardia NY for the chance to win promotion in a 2nd spot into the 1st Division come next season. As Hoboken and Spring Valley's game took place, just a few feet away on the track, Polonia Gwardia NY and KidSuper Samba AC played their 2nd Place Playoff Final with the former winning in a hotly-contested 4-3 win for the Poles. That win won them the opportunity to face D2 Champ Final losers Spring Valley come next Sunday for promotion.